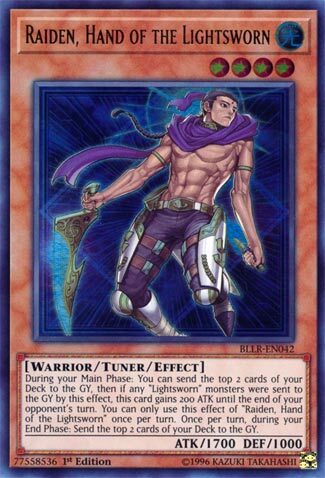 During your Main Phase: You can send the top 2 cards of your Deck to the GY, then if any “Lightsworn” monsters were sent to the GY by this effect, this card gains 200 ATK until the end of your opponent’s turn. You can only use this effect of “Raiden, Hand of the Lightsworn” once per turn. Once per turn, during your End Phase: Send the top 2 cards of your Deck to the GY. Raiden, Hand of the Lightsworn is a great Level 4 that has seen more play outside of Lightsworn since its release. Good stats and support, Raiden mills two, and gains 200ATK for each Lightsworn milled that way. The mill is the sole reason it is seen in any deck trying to get things into the grave. They may not get the ATK boost, but Raiden is will put four cards into the grave each turn it is on the field, setting up the graveyard as a quadruple Foolish Burial. As a Level 4 it’s good for Rank 4 plays and being a Tuner, gives you Synchro capabilities. He’s an all-around powerhouse of a Level 4, doing pretty much everything several decks need. You’ll see him in 60-card decks that are all about speed and the graveyard. Infernoids, Shaddoll, and Chaos-based decks can also main deck him with great success, but it’s those 60-card decks where he shines, as well as pure Lightsworn. Great card, searched with RoTA, and versatile. Raiden is an old favorite at this point. He’s an excellent search target for Rota or Charge of the Light Brigade. If he mills himself, he still gets to pump his attack from 1700 to potentially 2100 Atk per turn. Like most Lightsworns, he mills cards during the End Phase, in this case 2. Many monsters gain effects by being sent to the grave by a monster effect, and Raiden can do four per turn for free all by himself. On top of all that, he is also a generic Level 4 Tuner. This makes Raiden extremely versatile in multiple decks. Nothing negative to say about this. Raiden has all the tools necessary to be around for a long time, and by extension, keeps Lightsworns alive. I did this recently, but I was once again asked to choose the COTD cards for this week, so as I was struggling to think of a theme, I opted to go for cards in archetypes set to get Link Support in Extreme Force. The first card will represent the Lightsworn archetype: Raiden, Hand of the Lightsworn. Raiden is a Level 4 Light Tuner Warrior with 1700 ATK and 1000 DEF. Level 4 Warrior equals RotA, also being a Lightsworn makes Charge of the Light Brigade an option. Level 4 is also a pretty good level for a Tuner, and the stats and attribute are just fine. As a hard once per turn, during the main phase, you can mill 2 cards from your deck and Raiden gains 200 ATK if there was a Lightsworn sent. Raiden is a popular choice for many decks that like milling for this reason, he can mill up to 4 cards alone, 2 here and 2 off the end phase similar to every Lightsworn. The boost is nice, but isn’t too big. Being a Tuner, Raiden opens up Synchro plays, including into the very popular PSY-Framelord Omega. Any deck that has GY effects should consider running some Raidens along with Charge of the Light Brigade or RotA. He is a great card for getting mills in.